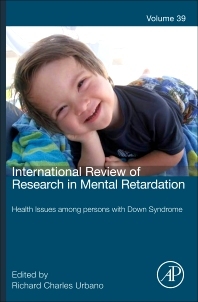 International Review of Research in Developmental Disabilities is an ongoing scholarly look at research into the causes, effects, classification systems, syndromes, etc. of mental retardation. This thematic volume, "Health Issues in Down Syndrome," will cover health issues for individuals across the life span. With the life expectancy of individuals now reaching 60 years or more, it has transformed from an acute condition with a short life span to a chronic condition that needs to be managed over a close to normal life span. The extra chromosome 21 that defines most cases of Down syndrome affects the functioning of many biological processes and organ systems. The cascade of events triggered by the extra chromosome 21 creates a complex set of medical conditions needing to managed over the life span. The ability to manage these conditions has led to an improvement in longevity and quality of life for individuals with Down syndrome.